Over the last few months, Julian Edelman hasn't lost many things. He recently won the Super Bowl - which landed him a Vince Lombardi trophy - and he was also named the Super Bowl's most valuable player - which got him another shiny piece of hardware. But on Friday, the New England Patriots wide receiver lost something very close to him, something he compared to a child, because "it grows on you": he lost his beard. After "nine months of hard work" and tucking away his razor for the entire football season, all it took was one appearance on The Ellen DeGeneres Show for Julian to say goodbye to his thick facial hair. 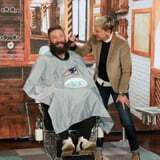 Ellen surprised the 32-year-old by asking him if she could shave his beard, and he obliged, but with good reason - she was going to donate $10,000 to the Boys & Girls Club of Boston. Even better? Julian said he was going to match her donation. Even though we're very impressed with Julian's clean-shaven look, Ellen, you could've left a little scruff there! Julian went from "B*tch, what's a curfew?" to "Sir, tell me what time you'd like your daughter home and I'll bring her back an hour early." Luckily for us thirsty sports fans, the scruff will grow back, as will the hopes of every other football team that doesn't have Tom Brady on its roster.